On the weekend, municipal councillors meeting as the Association of Vancouver Island and Coastal Communities voted in favour of getting open netpens out of B.C. waters! Thank you, for helping send a message to your councillor. Their vote will help to convince the Provincial government to act--but we need more. That's why today, we launched the Declaration in Defence of Wild Salmon. Sign it today and add your voice to those of the First Nations, the chefs, tourism operators, the academics, celebrities and business people who launched this campaign with us. As you're reading this, juvenile salmon are leaving their natal streams to begin their ocean migration. 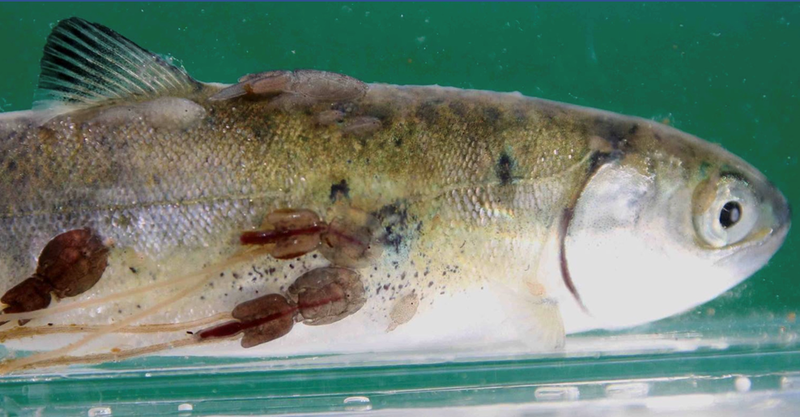 Many of them will end up like this little fellow--attacked by salmon lice from fish farms on their route. It takes only one or two lice to kill the smallest fish. Others will be weakened and fall prey to disease or predation. Join us in telling Premier Horgan to get open netpens out of B.C. waters.